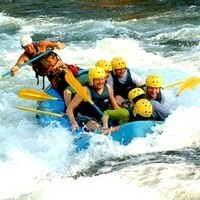 If you want to run along the river, use your might through oars. And feel yourself no less than the running water. 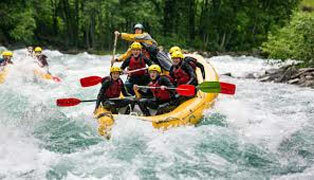 River Rafting gives you a thrilling experience and the opportunity to play with the cool Himalayan water, feeling the magic of the currents as well as an opportunity to enjoy the natural beauty of the surroundings. 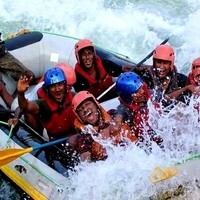 River rafting is organized ranging in difficulty from grades I to V.
The Indus River, locally known as the Singhe Khababs (out of Lion’s mouth), flows across the north west to the south east, passing through Ladakh and flows into Pakistan where it joined Shayok and Suru to become major historical Indus River. 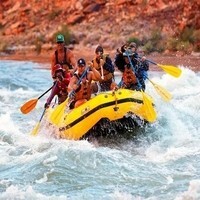 Water levels remain high during the month June to late August, which is the best season for fascinating rafting expeditions. White water rafting on Indus provides spectacular view of the landscapes of Ladakh and Zanskar ranges housing Buddhist monasteries on high cliff. 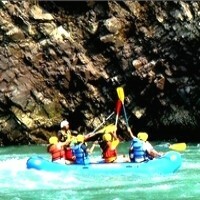 The white water Indus has rapids generally of I and II grades and at some places, has grade III to even V rapids. 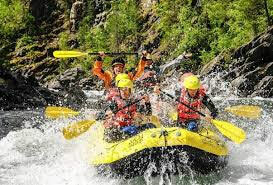 The popular rafting points are from Phey to Nimo and also from Upshi to Kharu or from Upshi to Nimo. The other points run from Phey to Saspol or Phey to the Indus - Zanskar confluence at Nimo and from Nimo to the historical monastic enclave of Alchi, about 75 Kms west of Leh. Experienced rafters may also want to try the more challenging route between Alchi and Khaltsey. Easier runs include the run between Hemis (40kms south of Leh) situated along a road crossing the Indus and Choglamsar, which is a three-hour trip that goes through quiet, calm waters, and passes through the riverside villages of Stakna, Shey and Thiksey (25km south-east of Leh), before ending at Choglamsar, just short of Leh city.